I wanted to share this special way we’re gifting our yummy chocolate treats to our friends, family, and teachers this Valentine’s Day. My kids LOVE to paint, so I created this little craft as a double whammy. The kids get to paint and the recipient gets a swell piece of artwork in gift bag form! 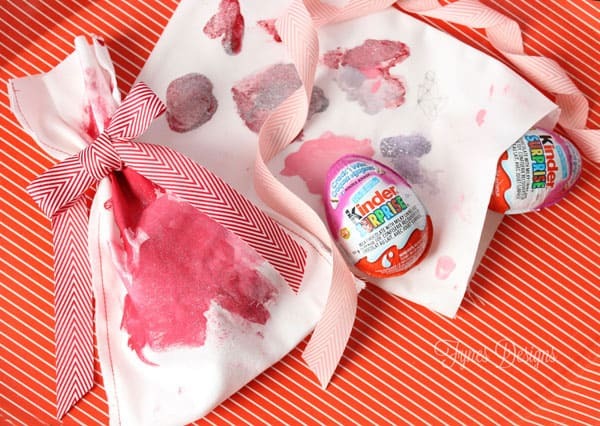 This craft works great for any holiday and who wouldn’t want to unwrap a yummy chocolate treat?! 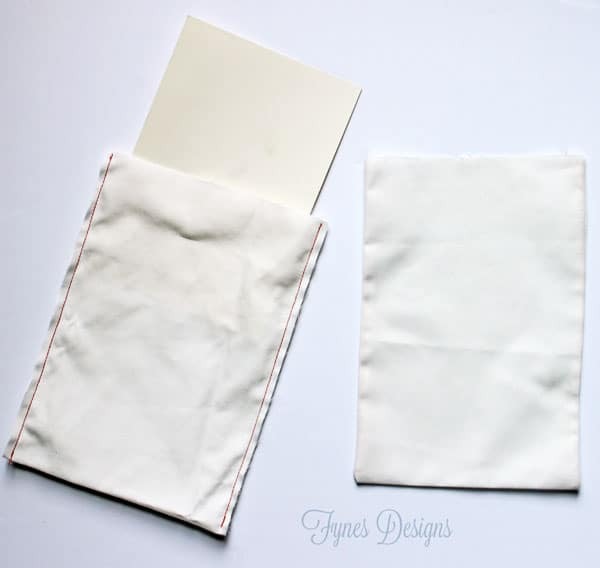 I sewed plain white bags, nothing special just scrap fabric sewn like a pillowcase (of course measuring much smaller, about 8″ long). Then slip a scrap of paper into the bag so the paint won’t transfer to the opposite side. 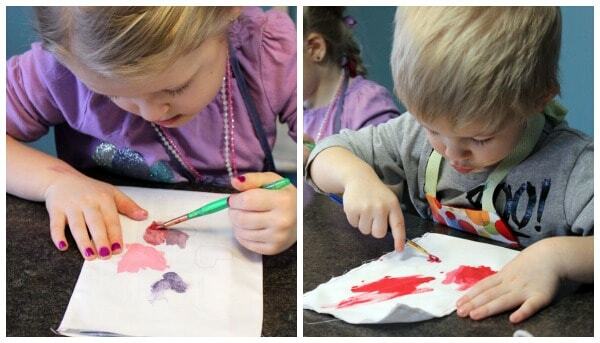 Acrylic paints work best, I chose some Valentine colors for the kids to paint with and let them go wild. The results? Not exactly VanGough, but the kids are so excited to gift them and I’m sure Grandma and their teachers will be over the moon to receive them! Packaged up with a sweet ribbon (May Arts of course) and you’ll have yourself some designer gift bags! Well that’s SUPER awesome! Will have to hold onto the paper next time as we had a couple and didn’t know this. Thank you for the heads up Virginia! Very cute – I love the bags! Nothing better than a hand made gift from kids! 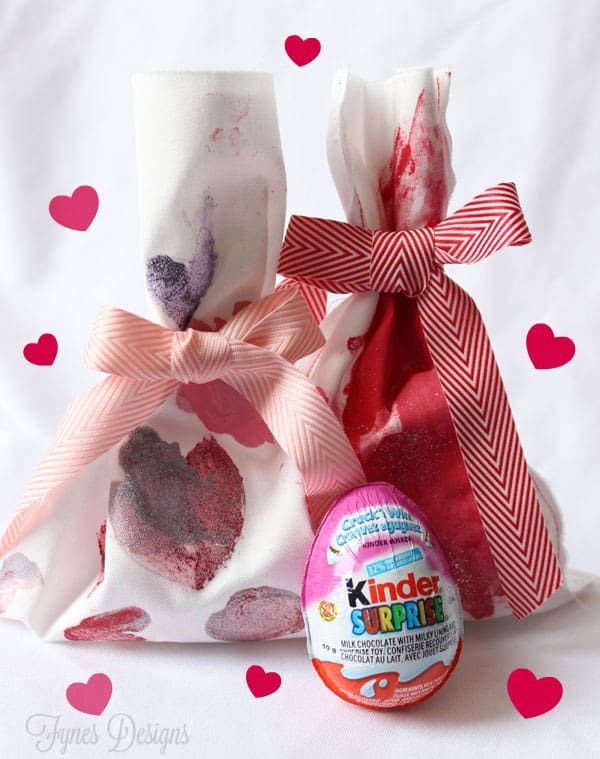 I’ll have to check out those Kinder Eggs…my kids go crazy over them! Its like buying a lottery ticket for your kids! ← DIY Puppet Theatre From an Old TV…with BIG Shine!